Article about the attempt of Rubber Tappers to organise that was linked to the struggle to protect the Amazonian rainforest. For centuries, those who made a living by extracting and collecting rubber from rubber trees had been virtual slaves to the powerful rubber barons who controlled the Amazon region. Attempts were made in the 1960s to unionize these workers, called “rubber tappers;” however, these attempts failed. The 1970s marked a shift in the dynamics of the extraction of resources from the Amazon. Ranchers from Southern Brazil began to buy up huge tracts of land in order to clear them for cattle grazing land. The rubber tappers who lived on this land were forcibly evicted, cutting them off from their source of income. This began new attempts to organize the rubber tappers and in 1975 a trade union campaign was successfully organized in Brasileia. The President of the union was Wilson Pinheiro and the Secretary was a young man from the Xapuri region, Chico Mendes, who later became the iconic figure of the movement. 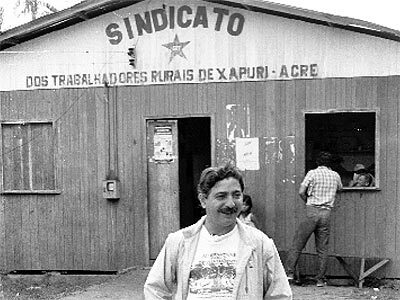 Having undergone training sessions in grassroots organizing, Mendes journeyed back to his hometown of Xapuri to establish a branch of the union there. With the help of Marina Silva, Mendes successfully organized the Xapuri Rural Workers’ Union in 1977. At the time a member of the city council, Chico was unable to serve as the head of the union and passed this responsibility to Derci Teles de Carvalho. The primary goal of the organization was to stop ranchers from clear cutting Xapuri’s forests for grazing land. In his speeches, Mendes drew a link between survival of the forest and survival of the rubber tappers, whose means of support was the Brazilian nuts and rubber they gathered from the forest. 1977 also marked the creation of a weekly paper called the Varadoura, which was founded to broadcast information on the deforestation of Acre region. The editor of the newspaper relied heavily on Chico to give him weekly updates of the campaign, which Chico used as a recruitment opportunity. The primary tactic of the campaign, employed from almost the start, was the use of empates, or “stand offs.” This tactic involved groups of activists confronting laborers hired to clear the forests and attempting to convince them to lay down their saws. Empates were overwhelmingly successful as many of the men hired to clear the forests had been rubber tappers before the taking of their land. This tactic was not solely benign however, as it often involved the destruction of the laborers’ camps and possessions, forcing them to return to their homesteads. Participants in the empates were often beaten and arrested by military police called on by the ranchers to keep order. The campaigners met this treatment with non-violence, such as singing hymns. When imprisoned, the campaigners often numbered too many for the jail’s holding capacity and thus were soon released. As the campaign evolved so did the empates, moving to encompass the entire rubber tapper community, men, women, and children. Women and children would move to the front of the group, discouraging the Military police from shooting into the crowd. In 1979 Chico introduced a strategy to establish schools and cooperatives on the rubber estates. The rational behind this agenda was that these programs would improve the living conditions on the estates, which would in turn give rubber tappers more incentive to organize to keep their lands and remain in the forest. Originally engineered for adults, the education program quickly expanded to children. Classes included literacy training as well as global and environmental awareness. Although the Mendes’ schools were a huge success, the attempt to establish cooperatives on the estates failed. Mendes tried to compensate for this by spending almost all of his time journeying from estate to estate spreading information and recruiting. 1980 marked the assassination of the president of the Brasileia union, Wilson Pinheiro. This resulted in a shift in the axis of the movement from Brasileia to Xapuri. The next few years were marked by a series of empates and assassinations of union leaders. Then in 1985 the UDR, Democratic Ruralist Union, was formed. This group was formed by the ranchers in response to Chico’s efforts to organize against deforestation. The UDR hired large numbers of armed forces to combat the union movement and initiated a number of targeted assassinations of union leaders. 1985 also marked the founding of the National Council of Rubber Tappers (CNS) by Mendes and other key union leaders. The group gained widespread international support since it was seen as both a social justice and environmental protection campaign. Later that year Chico organized the First National Rubber Tappers Congress. From this meeting emerged the proposal for extractive reserves, legally protected forest areas held in trust for people who lived and worked in a sustainable manner. This proposal offered an economically viable alternative to the clearing of forests for grazing land and would be the primary demand for the remainder of the campaign. In 1986 the Xapuri Rural Workers’ Union allied with the indigenous people of Brazil, who had also been historically discriminated against and overlooked. This was particularly significant because the Indians and rubber tappers had traditionally been at odds with one another over forest resources. Thus, the alliance between these two groups signaled for government officials the seriousness of the campaigns demands. In June of 1986 Mendes organized over 200 tappers for a march on the federal forestry office of Xapuri. Upon arrival the group staged a sit-in, but were quickly evicted by the police. For the remainder of 1986 and 1987 the focus of the movement was recruitment of rubber tappers for empates and rallying international support for the cause. International recognition of Mendes with the Ted Turner’s Better World Society Prize and United Nation’s Global 500 Environmental Prize, both awarded to him in 1987, spread awareness of the campaign. In October of 1988, following a renewed wave of empates, Mendes convinced the Brazilian government to declare a 61,000 acre tract of traditional rubber tapper territory to be off limits to logging. This tract was declared the first ever extractive reserve. This victory for the union sparked a wave of assassinations of the movement’s leaders. The constant recipient of death threats, Mendes warned authorities for over a month of his impending assassination at the hands of the da Silva brothers, two local cattle ranchers. These calls for protection were ignored, and on Thursday 22 December 1988 Mendes was assassinated by Darli Alves da Silva. Following his death, the Second National Congress of Rubber Tappers met in early 1989, issuing twenty-seven demands on environmental and human rights protection. Within the next decade several of Mendes’ co-campaigners were elected to important government offices, which helped to break the political stronghold of the UDR, creating a more receptive environment for legislation protecting the Amazon forests. As of 2001 twenty-one additional extractive reserves have been established in seven Brazilian states. However, this accounts for only 1.5 % of the area of the Amazon, and deforestation rates continued to grow in the Amazon, peaking in 1994. In addition, problems such as illegal logging and unstable rubber prices persist, making it ever harder for rubber tappers to earn a sufficient income. Revkin, Andrew. The Burning Season: The Murder of Chico Mendes and the Fight for the Amazon. Boston: Houghton Mifflin Company, 1990. Print. Rodrigues, Gomercindo. Walking the Forest with Chico Mendes: Struggle for Justice in the Amazon . Austin: University of Texas Press, 2007. Print. Place, Susan. Tropical Rainforests Latin America Nature and Society in Transition. Willmington, DE: Scholarly Resources Inc, 2001. Print. Tal, Alon. Speaking of Earth: Environmental Speeches that Moved the World. New Brunswick, New Jersey: Rutgers University Press, 2006. Print. Mendes, Chico. Fight for the Forest . 2nd. London: Latin America Bureau, 1992. Print. Palmer, Joy A. Fifty Key Thinkers on the Environment. New York City: Routledge, 2001. Print. Conca, Ken, and Geoffrey Dabelko. Green Planet Blues: Environmental Politics from Stockholm to Kyoto. 2nd. Boulder, Co: Westview Press, 1998. Print. Dwyer, Augusta. Into the Amazon. Toronto, Ontario: Key Porter Books Limited, 1990. Print.